One more entry in my Queens 1852 series, then I’ll give it a rest for awhile, though there’s still more territory to cover. I walked Queens Village, which today is centered around the junction of Jamaica Avenue and Springfield Boulevard, this past June (2017) but those photos have yet to surface; perhaps during the next few weeks I’ll figure out what to do with them. The area now known as Queens Village, centered at Springfield Blvd. and Jamaica Avenue, was known originally as Little Plains, then Brushville, after a local landowner, until about 1920. The present elevated station was constructed in 1924. Interestingly you can still see the remnants of a layup track here. In 1856, residents voted to change the name of the town to simply “Queens” and that name persisted until at least the 1920s, when the Long Island Rail Road added the word “Village” to the station name. Before the 1898 consolidation the village of Queens was located in the county of Queens, which may have led to some confusion. However, people have seemingly adjusted to saying “New York, New York” for over two centuries. The wavy lines at the top of the map depict the glacial moraine that bisects Broooklyn and Queens from east to west and forms a line of high hills. The Cemetery Belt, consisting of 17 separate graveyards along the Brooklyn-Queens line further west in Cypress Hills, was just starting to form at about this time. Today, the Grand Central Parkway runs along the moraine, which marks the southernmost limit that a glacier pushed south during the last Ice Age several thousand years ago. Only a few roads were built through these high hills. One of them was called Rocky Hill Road. I’ve done a FNY feature on this ancient road, which is still in place today, consisting of parts of 46th Avenue, Bell Boulevard, Springfield Boulevard and Braddock Avenue; only a short two-block stretch in Auburndale retains the old name. The Creedmoor Rifle Range was later built on the lands north of Rocky Hill Road/Braddock Avenue. Today’s Creedmoor Psychiatric Hospital was later built on its grounds. The west of the map was a flat, swampy plain in 1852 with only a few scattered dwellings and no roads traversing it. However, several roads still in use today can be found near the bottom of the map: Hollis Avenue, then known as Old Country Road before Frederick W. Dunton, a native of Hollis, New Hampshire, began to develop the area in the 1890s. Hempstead Avenue branches off from Jamaica Avenue as it did then, only today it is called Hempstead Turnpike in Nassau County, part of NYS Route 24. 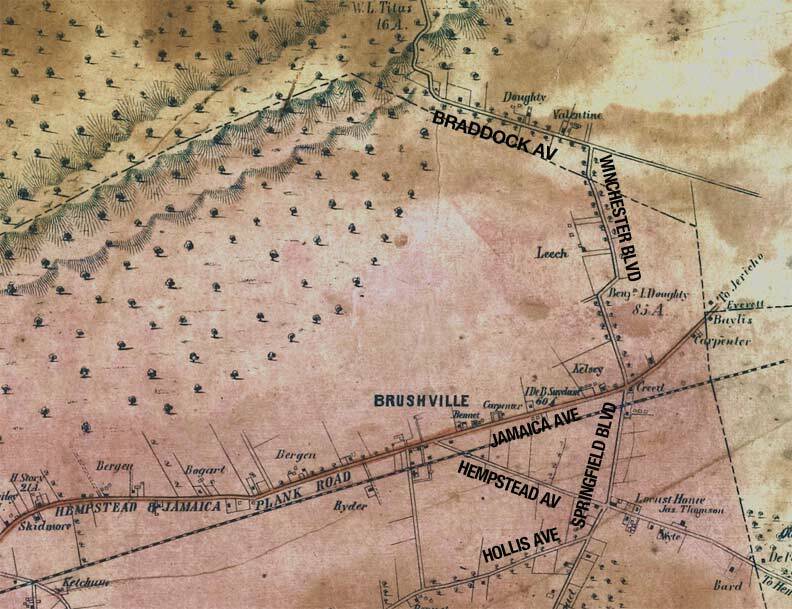 The major plank road through the region was the Hempstead and Jamaica Plank Road. As the name implies it took horses, carts and stagecoaches to and from the town of Hempstead, then in Queens, but after 1899, Nassau County. It evolved into Fulton Street in the town of Jamaica and the Jericho Turnpike east of that. The whole stretch in Queens was renamed Jamaica Avenue around 1920, and the section in Queens east of Cross Island Parkway was renamed Jericho Turnpike in 2005, matching the Nassau County name the road is known as. The entire stretch is also now NYS Route 25. Springfield Road ran through the Queens town called Springfield; the name survives in the boulevard and the Springfield Gardens neighborhood. The road was later extended north through the hills, assuming part of the old Rocky Hill Road route, and today ends at Northern Boulevard in Bayside. I love your series of discussions about “Queens 1852”. I wish you would wander a bit south away from what appears to be your favorite Queens neighborhoods to discuss in Forgotten NY. You always seem to feature, Maspeth, Flushing and Astoria. I would love to see a “Queens 1852” piece about Howard Beach, Ramblersville, Ozone Park, or even Woodhaven (even though you have covered Woodhaven and Richmond Hill on occasion.) Please consider something featuring the South Queens area. There are a number of Woodhaven, Richmond Hill, Jamaica, Broad Channel, Hamilton Beach, Far Rockaway pages. I don’t have a car, so I don’t visit those realms as often, but I do go. Very much appreciate the reply. I would love to see old maps of these areas like you show in the story of Queens Village. Of course you know there is a subway station in Old Howard Beach via the A train. Walking around Ramblersville and Old Howard Beach you can come across a lot of very strange streets and street names. If you venture across Cross Bay Blvd into the “new” side of Howard Beach, you can find a very old “farm house” now a residence on 90th Street between 156th and 157th Avenue that must have a very interesting story behind it. Just hoping you would come out this way one day….